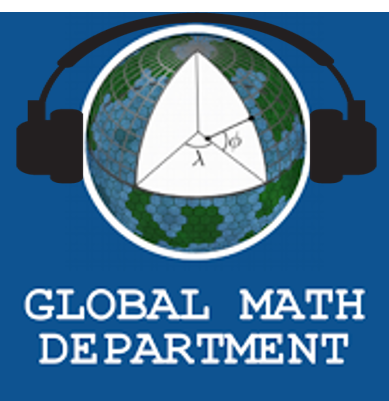 Last week the Global Math Department took a Spring Break. Don’t forget – recordings for all previously held webinars can be found here. Below is an example of a Maths Venn from Craig Barton’s free website https://mathsvenns.com/ where he shares numerous problems he has created. I’ve used these several times with students and I’ve found them to be a good example of a self-differentiated practice routine. Some students create very simple and straightforward equations while others might challenge themselves to find more complicated functions. I was first introduced this this type of problem by a RISP, or “Rich Starting Points” problem, shared by Jonny Griffiths. The problem, RISP 10, gave examples of Venn diagrams for practicing both linear and a quadratic equations. You could also use a variation of this task, as shown by Don Steward on his blog post Linear Equations and Mr. Venn, by giving students a list of functions and asking them to place the functions in the correct section. You might be familiar with Christopher Danielson’s work through his visually stimulating books Which One Doesn’t Belong? and How Many? If you’re not familiar with his work, no worries. Now you have links to explore his work and have enjoyable conversations with others about attributes and quantities. Head over to his blog and enjoy! There is no shortage of conferences and gatherings in the mathematics space. Next week, the National Council of Teachers of Mathematics (NCTM) will hold its annual meeting in San Diego. Speakers were recently notified of proposal acceptances for NCTM Regional conferences this fall. Many NCTM state affiliates hold their gatherings throughout the year. Although Twitter Math Camp (TMC) will not hold a gathering this year, other smaller events have taken and will take place this summer, including TMCNYC in New York and the Southeast Math Summit in North Carolina. Due to a series of recent events, many are questioning their own values regarding equity within conferences, i.e. diversity among speakers and attendees, and equity strand vs. an equity focus. Some are having conversations for the first time. As much as these conversations are needed, there is a real danger in continuing with business as usual if the conversations continue to happen in private, and within racial groups. There are people who are taking steps to have those conversations in public. The SE Math Summit, envisioned by a group of people including Jennifer White, Rachel Lawrence, and Alli George, is set to take place in Winston-Salem, North Carolina in July. In their call for proposals, they include a question about equity similar to that of NCTM. Knowing that this is an area of concern, Rachel wrote a blog post entitled The Who, What, Why, and How of Equity describing her own thinking. It is a long but important read because she admits to her imperfection and also shows us her growth in this area. Additionally, Naomi Jessup and Barb Everhart are hosting a diversity and inclusion chat on Tuesday, March 26. See this link for homework and meeting information. Lastly, some in the literacy space have gathered to create a pledge about their commitment to ensure equity in education conferences going forward. There is much that the math community can learn from them by following the #EducatorEquity hashtag. They have also created a letter for potential speakers to use in articulating their thoughts. Many have been working behind-the-scenes for a long time on creating equity in education. Hopefully, math education can join in the effort in a public way.